Andy Murray's hopes of winning a second Grand Slam title were ended in Melbourne by an impressive display from Novak Djokovic. "In taking on three of the finest players in history and not just matching them but vanquishing them, repeatedly, Murray faces one of the great challenges in British sport." The Briton won the first set, but the world number one prevailed to become the first man in 46 years to win the Australian Open for three years running. With Murray needing treatment for blisters, the Serb was the stronger man over three hours and 40 minutes and won 6-7 (2-7) 7-6 (7-3) 6-3 6-2 to collect his fourth title in Melbourne and sixth Grand Slam in all. BBC Sport's tennis experts give their verdicts on Murray's performance and asses how the three-time Australian Open finalist can improve his game. The better man won the match. Once Djokovic won that second set he just started to find another level and Djokovic was the aggressor, he took more risks and more chances. That's the lesson we've learnt today is that there's another level with Djokovic. He raised his level to the occasion and kept on playing better and better. Murray has to think: how can I stop this? How can I improve? He has already improved so much over the last 18 months. He's fit enough, just tactically [he needs to change] a few things. It's not much. It is decided by details. Yes, he's got better, but so has Djokovic. In the fourth set, Murray wasn't as fast anymore but tennis-wise Djokovic just outplayed him and that's the reason he lost. It was an absolutely outstanding match. Some of the gets Djokovic made - balls were coming back from ridiculous positions. He really just went up a gear and suddenly started accelerating and Murray could not keep up with him. It looked, to me, that Djokovic could play for another five hours. 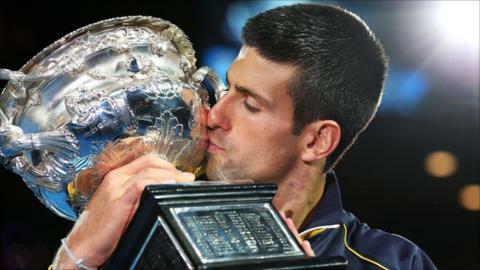 Djokovic is just magnificent, absolutely magnificent. Murray seemed to be struggling towards the end. I'm sure the feet were sore, but that's no excuse. [Roger] Federer moved the bar, [Rafael] Nadal came in and now Djokovic has really raised the bar. For Murray, it's the small things. He's going to have to take the ball earlier and go for more winners because that's what Djokovic did in the third and fourth sets. Once Djokovic gets into his rhythm he is almost impossible to stop and unfortunately for Murray he did get into his rhythm at the end of the second set. Djokovic played a good tie-breaker, settled in and didn't make any mistakes. It just goes to show how tough it is to back up a five-set win against one of the top four with another. Murray is probably the second best player in the world at the moment, improving all the time and there's not a lot coming up the back to frighten him. The Brits did really well, Laura Robson's effort was fantastic and to beat [Petra] Kvitova showed real maturity. She'll be a top 10 player and who knows further than that. It was a very exciting tournament the whole way. For two sets it was exceptional tennis, but Djokovic really showed why he is number one: his sustained ability to come up and deliver time and again at the highest level. Murray gave it is all. It was a terrific contest, as it is every time these two step on a court. We have a great champion in Andy Murray. You sense he belongs in there and he's disappointed but exudes confidence he will get that trophy. It was a terrific event all round.